The pop up containment pool is a quick and easy way to catch leaks and spills from equipment, valves, and other machinery. Often used as part of an emergency response spill kit, decon shower, or temporary containment tank, these decon pools are an easy way to temporarily store and contain liquids in the event of a spill. Pop up containment pools are available in sprung steel, economy, and plus models to meet different site requirements. Typical sizes range from 20 to 400 gallons to accommodate small equipment (such as modest tanks or 55 gallon drums) as well as large valves or storage unit leaks. If you have questions about the containment pool, give GEI Works a call at +1-772-646-0597 or request a price quote. (76 L) Wall 8", Top 28", Bottom 35"
(250 L) Wall 12", Top 42", Bottom 53"
(379 L) Wall 12", Top 53", Bottom 64 1/2"
(568 L) Wall 12", Top 64", Bottom 76"
(946 L) Wall 12", Top 73", Bottom 85"
(1,514 L) Wall 20", Top 73", Bottom 85"
*This containment pool features continuous band of sprung steel to provide rigidity to outer circumference. (75 L) 18" x 58" x 5"
(250 L) 60" x 58" x 5"
(565 L) 144" x 58" x 5"
The economy pop up pool has two storage options available. 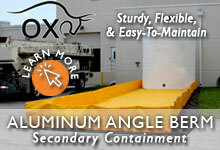 The cab mount container is a round, polyethylene container that bolts to the cab of a trunk. 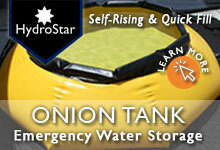 Durable and lockable, the container keeps the decon pool handy in case of spills or leaks. If you don't have a truck the right size for the cab mount, yellow storage bags are available for the 20, 66, 100, and 150 gallon economy models. If you have questions about decon pools, give the GEI Works team a call at +1-772-646-0597 or request a price quote.